new formula of waterborne gloss wax leather for improved. Wipe the feel better, easier construction. After construction, moisture, light, with persistence, and dry and not greasy. Water-based leather light wax containing special ingredients, anti-UV Sun, VU, prevent aging. Its protection is extremely good. waterborne gloss wax for leather suitable for plastic, rubber, leather, bumper. 1:3 diluted with water, light can be used for engine room when protection agents. You can see like new car engine room of shiny. 1. waterborne gloss wax for leather on the proper amount to sponge. 2. gently wipe the surface maintenance items, let it dry. 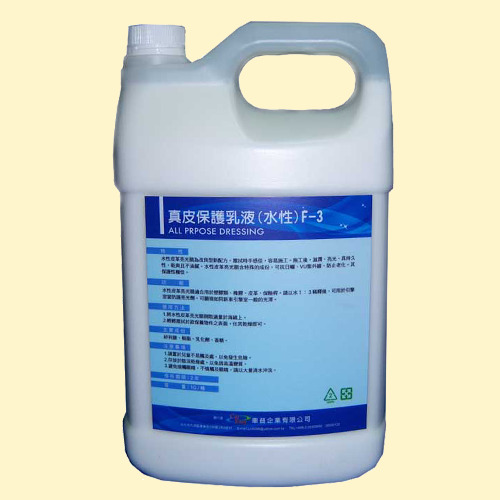 Silicon likang, resin, emulsifier, flavor.